引用元：“No more Hiroshimas, no more Nagasakis. 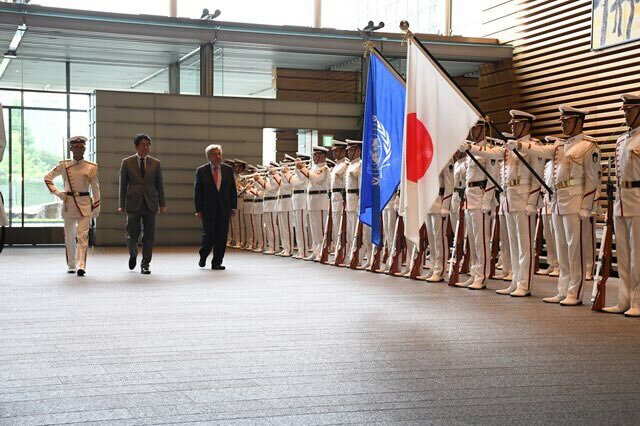 We must make sure nuclear weapons are never used again.” — @antonioguterres during his visit to Nagasaki, Japan. 引用元：“Meeting the survivors of the atomic bomb attacks on Nagasaki and Hiroshima was an unforgettable experience. I will do everything in my power to support their message to the world: no more Hiroshimas, no more Nagasakis. We must make sure nuclear weapons are never used again.” — United Nations Secretary-General António Guterres during his visit to Japan, 73 years after the atomic bombings of Hiroshima and Nagasaki.